Total area: 1,043 square kilometers. Pakbeng is a small town, located on the Mekong River about halfway between the Thai border at Huay Xai and Luang Prabang, Laos. Pakbeng is connected by a sealed road with Oudomxai along the Nam Beng River. 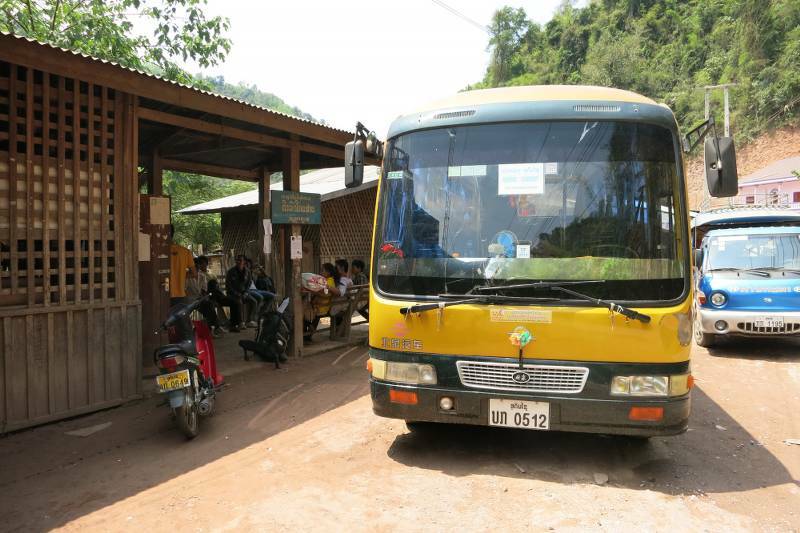 Most tourists will have to stop here over-night on the slow-boat trip to/from Luang Prabang. It`s also possible to arrive by speedboat en route to the north. Much more uncomfortable than the slow boat, however you will arrive before the slow boat. There are several guesthouses that usually have attached restaurants, a sauna, and many local hill tribes living close by. You also get to see the town as the only Westerner. Sichomchaeng Temple is one of the oldest temples in the region and was built in 1560. It’s situated in the center of Pakbeng town. In the past, this temple used to be a place for some of the French soldiers and the area was occupied by them. They escaped some years later when they lost the war. When you are up on the temple you will see a very nice view from the Mekong river side with beautiful green forest growing around. It could be a viewpoint, too. You can also experience the old temple with different structural design or architecture as well as a 100 year old drum. Pakbeng residents believe that the temple is a peaceful place for all nations. The opening time is at 7:00 A.M and close at 18: 00 P.M.
A long time ago local people from the area used to go to the forest to collect food and firewood for their daily consumption. In order to protect their discovery from being exploited by others, they kept the cave as a secret. Local people trapped bats from the cave for sale. ( for gunpowder production ) and as a type of fertilizer for their gardens. However, during the turmoil from the Indochina wars the veil was lifted and the cave was used as a shelter from the bombing for everyone in the area. Still today, when visiting the cave, you can ask for protection or another wish, and you can be sure it will be fulfilled. Phoung Xieng Noi Village is located in the Northwest of Pakbeng town, about 2 Km from the town center. The main tribe in the village is Khmu. The village consists of 65 families, 55 households and the total population is 350 people – 174 female. The local residents there focus more on agriculture and livestock. The majority of the people there are animists. A village where you can find out more traditional Khmu’s way of life, Khmu New Year celebration festival is held in the mid - February we can also call the event “Boun Kler”. In addition, the villagers there also produce various handicraft products such as, rice basket, bamboo fan, broom grass, bamboo table and many more. 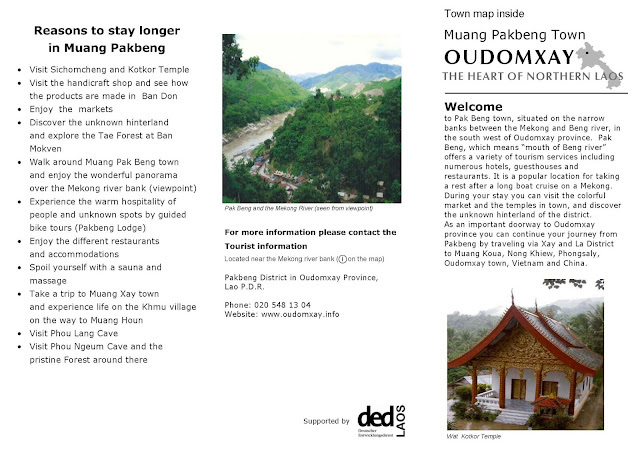 Therefore, the village has become a tourist destination in Pakbeng for all domestic and foreign visitors. If you need to know more about the village just be ready and spend yourself there least once in a life time. The boat landing is at the end of Rd 2 on the Mekong. Slow boats leave in the morning in both directions. They depart when full but expect to start at around 09:00. Arrive early to get one of the better seats (as far away from the loud engine as possible). The dropping off boat normally arrives at about 17:00, but this is Laos, so bear in mind that this is a guideline. Laos’s transportation departs when the driver can be bothered. It's best just to relax and enjoy the peace and quiet. And have a beer, of course. Slow boats between Huay Xai and Luang Prabang take two days to cover the 300 kilometres, and either way it costs about 220,000 kip. 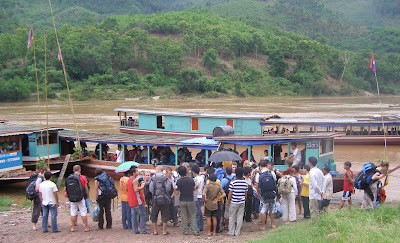 The boat is also able to stop at Pak Ou caves (near Luang Prabang), usually by passenger consensus. Passengers are required to buy their own entrance ticket, and occasionally boat staff demand an extra payment of $1 per person in order to stop. It is also possible to do just one leg of the journey for 110,000 kip. Departure times vary according to a number of factors including river speed -- it's a longer journey heading upstream -- but generally take place between 08:00 and 09:30. A minimum of about 20 people are usually needed to depart, which is usually not a problem. Sometimes as many as 80 people are packed into one boat. There is nowhere to stop or buy lunch along the way, although there is usually a small snack shop on board selling beer, Pringles and noodles in a cup. Bookings can be made at any travel agent and many guesthouses in Luang Prabang and Huay Xai. Tickets are also available at a much higher price in Chiang Khong in Thailand as are package deals with accommodation in Chiang Mai. The best option? Head down to the dock and purchase the ticket at the ticket office for the best price. The Luangsay Cruise is a more expensive but luxurious way to travel this route, and unlike the backpacker option, includes accommodation at the gorgeous Luangsay Lodge as well as all meals, stops at ethnic villages and Pak Ou Caves, and assistance and transport crossing the border to Thailand. Prices vary seasonally between $400 and $700. Rocket boats also make the journey between Huay Xai, Pakbeng and Luang Prabang. A faster but more dangerous and noisy option, these speedboats can do both legs of the journey in 2.5 to 3.5 hours each. The small, colourful boats are very noisy, and earplugs are a good investment. Some people have experienced temporary hearing loss. Most passengers wear helmets to fight the noise as well as for safety, and lifejackets for protection from the sun and biting wind. Horror stories do abound about the speedboats, ranging from death to crashes to engine failure and being stranded by the side of the river waiting for another boat to pass. Despite this of course most speedboats do make their destination in one piece and in just a fraction of the time of the more solid passenger ferries. It is often the transport of choice for Lao people who can afford them. Speedboats depart from separate piers in Luang Prabang and Huay Xai (transport to the pier is not included in the ticket price) but the same pier as the slow boats in Pakbeng. They leave when the boat is full -- six tourists or eight Laotians. If the boat is not full, you can pay extra to cover the full price of chartering the whole boat. 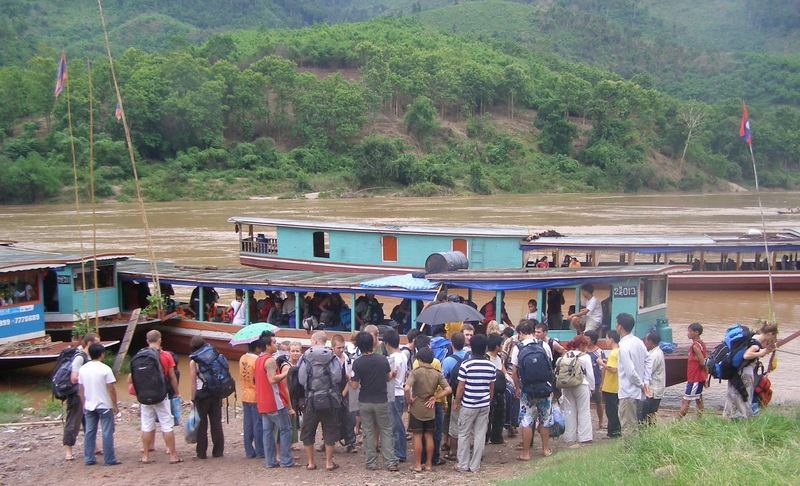 The full journey between Huay Xai and Luang Prabang is 340,000 kip per person (2,040,000 kip to charter the boat) and one leg either way to or from Pakbeng is 170,000 kip per person (about 1,020,000 kip for the whole boat). A bus from Udomxai often arrives in Pakbeng by midday with other passengers wishing to use a speedboat so it's a good idea to wait around if you don't want to hire an entire boat. The Pakbeng bus station is located 2.1 kilometres out of town along the main road. A tuk tuk there will cost 10,000 kip. Most go to and from Pakbeng by river, but a good paved road leads to Udomxai, 144 kilometres away. It is a smooth and easy ride, however, the bus does stop frequently to pick up and drop off passengers and their goods. If the 09:00 bus from Pakbeng departs on time, it is possible to get to other destinations like Muang La or Luang Nam Tha via Udomxai in one day. The bus from Pakbeng terminates in Udomxai's new bus terminal and depending on where you're heading next, you may have to transfer by tuk tuk to the old bus station in the city centre. See our Udomxai Transport section for more information. Udomxai: Departs 09:00 and 12:30, takes 4 hours and costs 40,000 kip. Your best bet is to get on the earliest departure in case the later one is cancelled due to low passenger numbers. Twelve kilometres upriver from town, a bridge across the Mekong is under construction and due to be completed at the end of 2015. It will connect National Road 2W in Pakbeng District, Udomxai province with 2E Ngeun District, Sayaboury province. Funded by a loan from EXIM Bank of China, the clear advantage is that China will have yet another direct transport route to Thailand. Until the bridge is finished, there is a ferry to the other side and we are told there is sometimes a bus to Muang Ngeun at 09:00, with a ticket costing 50,000 kip. Huay Kon/Muang Ngeun is an official Thai/Lao border that few travellers use. However, it is open to foreigners and visa on arrival service is available from both countries. In Muang Ngeun it's possible to make a connection to Hongsa and Sayaboury, but if you're looking to go from Pakbeng to either of these towns, the faster, more reliable route is by boat then songthaew. See Boat section for details. A bus to Oudomxay around 07:00 and it costs around 45,000 Kip and it takes 3 hours. A bus leaves at 12:00 from Muang Ngeun (near the Thai-Lao border), costs 30,000 kip, and takes 1.5 hours. Get around: There are only a few streets, so just walk around. Most of the guesthouses are along the first 50 m of the main street as you head up the bank. With the roads and particularly the rocky bank just above the boat landing being very steep, it might seem tempting to accept an offer for someone to carry your bag for you. Just ensure that if you do so you agree on the size of the tip beforehand. I watched the latest episode of Six. The show stars Walton Goggins as a former Navy SEAL captured by Boko Haram. He's placed in a cell and forced to watch as one of his female friends is gang-raped by crazy Muslims. Six is a great series filled with violence and naughty language. I give it my highest recommendation. But I'm biased. I love Walton Goggins. He's got the best teeth in the universe. They're so big and white.